After the events of The Force Awakens, fans were left with more questions than they had going into the theater. Two long years later, and they will again be left with some answers and a lot more mystery in the next rendition to the franchise. 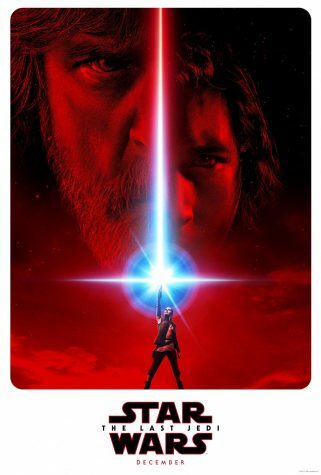 Picking up right where the last film left off, The Last Jedi continues the stories of Rey as she meets the long lost jedi, Luke Skywalker, Finn awakens from cryosleep after suffering his wounds from the battle at Starkiller Base, and Leia and Poe lead the resistance movement against the ever growing power of the First Order lead by Supreme Leader Snoke. With respect to the mystery behind the film’s plot left in the promotional work, this review will remain vague in the way the filmmakers have desired, but will still be an honest criticism of the films flaws and praise to what it does right. While guilty of following taking several of the same steps as the original trilogy, the film still rhymes with The Empire Strikes Back with its tone and beats. It does so in unpredictable new ways and goes for some twists and turns that audiences never saw coming. The risks the writers decided to take will polarize viewers, but there should be a respect for the studio for doing something different. Veterans and new faces alike show off their skills on the cast. Mark Hamill gives his best outing yet as the now old Luke Skywalker. Luckily, we get to see more of him than just standing on an island without any lines to say. He is in the forefront of the story and is not how long-time fans of the saga may remember him. Events from his past have changed the character into something viewers may really appreciate. The late Carrie Fisher reprises her role for the last time as General Leia Organa. With her heartbreaking last performance as the leader of the Resistance, the icon goes out with a bang. The actress passed shortly after production. Fisher will be sorely missed both on and off the big screen. Along with the Jedi Master, returning as well are Daisy Ridley, John Boyega, Oscar Isaac, and Adam Driver, all reprising their roles from the previous movie. Among the fresh faces to the franchise is the character Rose, played by Kelly Marie Tran. She and Finn have a shared subplot that, when on screen, grinding the story to a halt. Not only is it unnecessary for them to even be on their side quest, but the pair commit the worst sin a movie possibly can: it is painfully boring. The duo has no chemistry and they do little more than waste screen time. Their subplot was as uninteresting as they were, and it could have been easily written out of the script for the better. It was much more entertaining watching the Porgs run around than it was to see their entire storyline unfold. Overall, the Star Wars sequel is a worthy member of the saga and will keep the attention of fans for the future of the franchise.